Welcome to Wei Lai Group @MSU! We work on materials for energy storage and conversion through integrated experimental and computational methods. At present, about 80 percent of energy input in US comes from fossil fuels and 61 percent of energy output has been wasted primarily as heat. 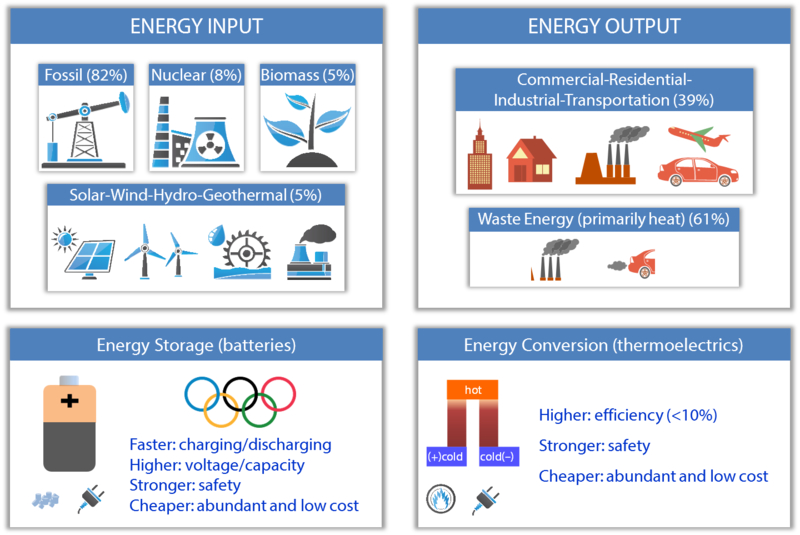 In order to increase the renewable energy usage and recover waste heat, materials that enable better energy storage (batteries) and conversion (thermoelectrics) are required. However, the fundamental understanding of electrons, ions, and phonons in energy materials remains limited, which hinders the improvement of exiting materials and design of new materials. Advancement of scientific knowledge in materials becomes paramount to future energy applications and has been the focal area of our research.